By 1948, under David Ben Gurion’s direction, the Israeli government developed the Israeli Terrorist Cell, Unit 131. In the mid-1950s, the U.S. was friends with Gamal Abdel Nasser and Egypt. Ben Gurion, an avid Zionist and Israel’s first Prime Minister, envisioned an Egyptian terrorist attack against the U.S. in order to destroy that alliance. However, that was not a probability, given the relationship between the two countries. Therefore, the Israeli government developed a pattern of using young Israelis who disguised themselves as terrorists of whichever country they were attempting to implicate. This concept would be applied during Operation Cyanide, involving the USS Liberty, in an attempt to initiate warfare. Secretary McNamara ordered the aircraft recalled a second time. Admiral Geis was told that President Johnson had ordered the aircraft to be returned, “He would not have his allies embarrassed, he didn't care who was killed or what was done to the ship.”  According to Admiral Geis, President Johnson, known for his ruthlessness and vile profanity told Geis, “I want that goddamn ship going to the bottom. No help – recall the wings.”  Tony Hart, a Navy communications technician stationed at the U.S. Navy Base in Morocco in June 1967 reported that McNamara responded, “We are not going to war over a bunch of dead sailors.”  If the USS Liberty had sunk, as Johnson wanted, Israel and the world, because of the media, would have blamed Egypt. Government officials, including the McCains have maintained absolute silence regarding Israel’s assault on the Liberty. Apparently, Operation Cyanide included an Israeli war against Egypt in order to depose Gamal Abdul Nasser, a purported Soviet puppet. The U.S. government sent intelligence and military specialists to Israel months before to plan and prepare for the operation. 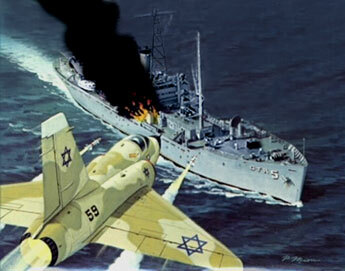 The operation was an agreement between Johnson and Israel during which the USS Liberty was supposed to sink, along with all of her crew. When Israel’s attack failed to sink the ship, the game plan changed which included an apology from Israel and a phony cover story. According to author Peter Hounam, a U.S. intelligence agent claimed that Captain McGonagle was aware of the pretext and the intentions of the U.S. to attack Egypt. Officials briefed him to anticipate a superficial strafing attack on the USS Liberty. The attack unexpectedly accelerated, perhaps because what the Liberty’s surveillance revealed about Israel’s terrorism against the Egyptians.